ALL NEW BACKS, PIPS & TUCK BOX DESIGN. In April 2015, Ellusionist put a deck of Sleepers in hands of 10,000 people and listened to what they had to say. It was hailed by the community as a perfect 'Cardistry' deck, with pips too abstract to perform magic tricks with. So Ellusionist went back to the drawing board and crafted brand new pips. Stripping the back design to ornamental minimalism. Using every line, dot and letter to it's full potential. Beauty and function colliding. The war between Cardistry and Magic has gone on too long. It doesn't matter if they're for sybils or swivel changes. The real question is... why not both? Sleepers Insomniac's blur the lines between the two art forms. The result is a practical pack of playing cards with cardistry aesthetics. 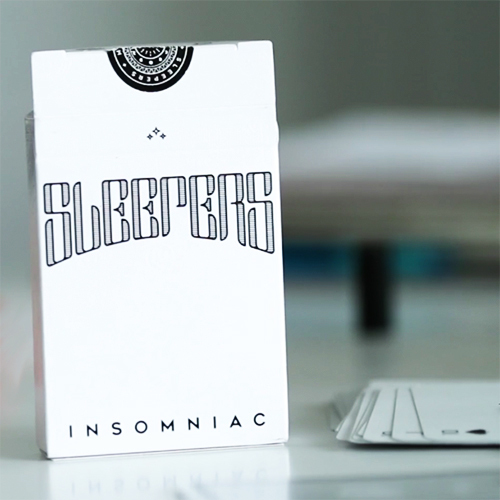 These are the Sleepers Insomniac Edition... and they could be yours! • Ellusionist quality. • The cards are poker size. Αυτό το προϊόν προστέθηκε στον κατάλογό μας την Wednesday 03 May, 2017.